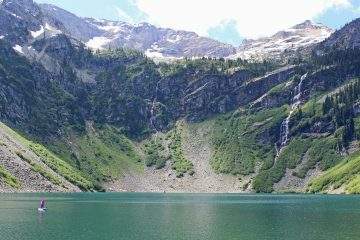 Situated high on a divide between waters from the Cle Elum River and the Teanaway River, Hawkins provides superlative views of peaks between the Enchantments and the Cascade Crest through the Alpine Lakes Wilderness. Maps: USGS Mount Stuart. View our topo map. Note: use ‘Print Preview’ before printing to properly scale this map to a full sheet of paper. –Traveling south on Highway 97, turn onto Highway 970. –Follow Hwy 970 for about 3 miles before turning right (north) on Teanaway Rd. –After about 9 miles on Teanaway Rd, turn right (north) onto North Fork Teanaway Rd. –Just past 29 Pines Campground, take the right fork of the road. –A short spur on the left side of the road will take you to the DeRoux Campground and the trailhead for the DeRoux Creek Trail. –Follow the DeRoux Creek Trail. A small campground at the trailhead is a nice amenity if arriving the night before; Beverly Campground is also just down the road a few miles. –The trail has two key bridges in place that are of high value to hikers. The first crosses the North Fork Teanaway shortly after beginning the hike. The next crosses DeRoux Creek a few miles up the trail. These are in good condition. 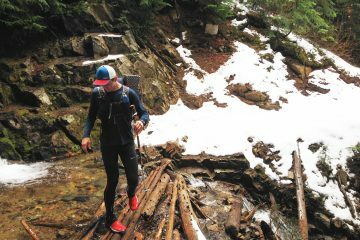 –A second crossing of DeRoux Creek at about 5000′ elevation has no bridge or convenient log. Boulder hopping will suffice later when stream flows subside. Some trail work has been done on the lower part, with several logs cut and cleared. Other logs will be small obstacles in places beyond what’s been done so far. –An easy scramble route (class 2) above Gallagher Head Lake ascends to the col between the western and eastern summits and then continues on to the western summit. This summit is actually divided into two small points, with the northern one being slightly higher. –In the spring, about half of the route from trailhead to summit may still be snow covered, which may slow one’s pace. Issues: Going into this area while significant snow is still about will likely provide for a quieter time, since Gallagher Head Lake is accessible by motorized vehicles later in the summer season. Hikers are recommended to visit the area on a weekday if visiting later in the summer.